Ever since the news broke that PDP had been working on a gamepad that would be licensed for Mortal Kombat X, I was curious about it. While PDP isn’t always the first name to be mentioned when people talk about gamepads and joysticks for consoles and PCs, they still end up making quality products that have the knack for getting passed over. So when I reached out to PDP to get some more information about the controller, I was surprised when they mentioned that they would send over a review sample of the gamepad. My initial reaction was two-fold; Would the controller be any good and why would anyone want this controller. However, once I got my hands on the gamepad and put it through the paces, I was happy to see that not only were my questions answered but I also found a new controller to use with my fighting games. 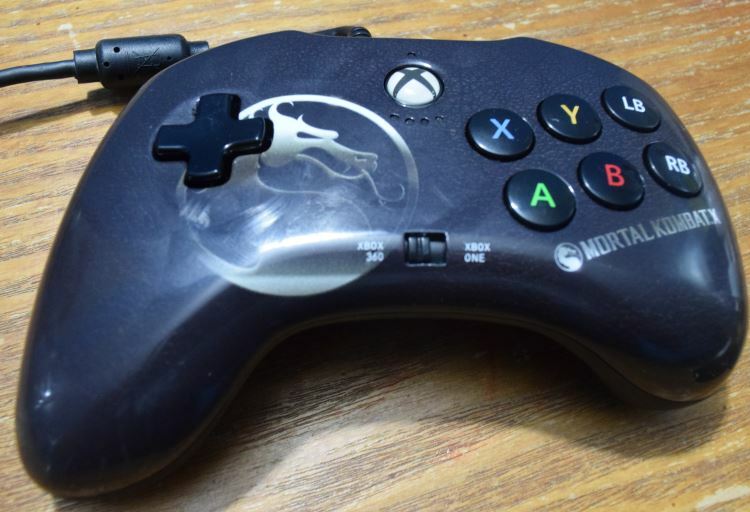 The first thing you’ll notice on the PDP Mortal Kombat X gamepad is gone are the left and right analog sticks that would you find on a PlayStation DualShock or Xbox 360/Xbox One controller. I wasn’t sure how I felt about that at first, especially since I tended to drift back and forward between the d-pad and analog sticks when I played fighters. Now before you ask why, it’s common knowledge that the d-pad on both the mentioned controllers are pretty bad and are useless when playing certain games, unless you’re some kind of gamepad GOD (IE; Fanatiq). So in the heat of battle when I couldn’t toss a Hadoken to save myself, I ended up hitting up the analog stick for that function. But with the PDP gamepad, I didn’t have that issue and found that pulling off most attacks and special moves were pretty easy to do. That’s definitely a plus in my book. However, since there are no analog sticks on this gamepad, this is completely useless for anything other than a fighting game. Platformers, racing games, first person shoots and just about every other game will not work with this. Keep that mind folk! The front-facing buttons were also a pleasant surprise as they weren’t the basic rubber/push job and instead were actual micro switches that clicked when you pressed them. They were really responsive, a huge benefit of using microswitches. I would be amiss if I didn’t mention how well the controller felt when I was holding it. The contour of the gamepad allows it to rest between the palms of your hands and your bottom fingers and are quite comfortable as well. I had zero issues holding it while hitting the top two trigger buttons. PDP also has moved the start/select/menu buttons to the top of gamepad so they don’t rest on the face of it. This is actually a smart idea, especially since many people, including myself, tend to hit them accidentally. Another handy function is that the gamepad can double up for use on either the PlayStation 3 & 4 or Xbox 360 and Xbox One. All you have to do is change the switch located at the bottom of the controller and you’re set. For you PC gamers, you can also use the Xbox version of the gamepad. Just make sure that you set it to the Xbox 360 selection. For some reason, if you set it to the Xbox One selection, your computer will not recognize it. Originally I thought it was my computer, however, I tried it on two other computers and the result was the same. My only gripe with the gamepad is that the top trigger buttons aren’t as responsive as the front-facing buttons, while they do give an audible sound when depressed you can tell that they don’t have a micro switch under the button and if it does it doesn’t feel like it. I also wished that PDP had when with a rubberized backing for the gamepad. While it looks like it is rubberized, it isn’t as the controller had slipped out of my hands a number of times while my hands had started to sweat during game-play. Lastly and this is important for online play, is the lack of a port to use a headset, so you will have to utilize a wireless headset if you want to chat it up while using this controller. Complaints aside, this is quality controller from PDP that will appease any fighting game fans who are looking for a worth-while controller without breaking the bank. And for Xbox One gamers, this is actually the only game in town for those who prefer a gamepad over a joystick. While PDP isn’t always the first name when it comes to fighting game controllers, they have nailed it when it comes to the Mortal Kombat X gamepad. Other than the controller slipping out my hands due to the backing of the controller and the trigger buttons, I felt that the controller was great. I highly recommend this for fighting game fans on the PlayStation 3, PlayStation 4, Xbox 360, Xbox one or PC. Now I just wish that PDP would make a Killer Instinct or Street Fighter version of the controller.